Leticia Rodriguez grew up in Austin, Texas surround by Mexican musicians. Her aunt, Eva Garza, was one of the first internationally recorded bilingual artists to crossover in the United States. Eva recorded over two hundred songs for various labels and starred in more than 20 films during the 1940s and 1950s. 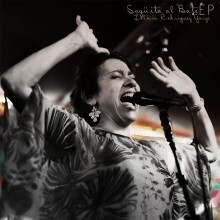 She served as the primary influence for Leticia Rodriguez’s latest EP, Sagüita Al Bate, to the point where Leticia decided to add “Garza” on to her performance name. Leticia Rodriguez Garza’s songs have a variety of Latin and Afro-Caribbean influences, but have the strongest roots in Mexican, Cuban, and Argentinian music. In addition to being a singer, Leticia is a dancer and choreographer, as well as the producer, writer, and director of the one-woman show she calls Canciones for Generations. The show is also inspired by her aunt, Eva Garza, and eventually led Leticia to create her first album La Americana, which is her tribute to some of Eva’s most influential and popular tracks. “Milonga Sentimental” and “La Cumbancha” were both originally slow and dramatic songs, meant for dancing the tango and the waltz, respectively. Leticia puts her Cuban-Mexican spin on them, and lightens them up with new horns and rhythm patterns. “Milonga Sentimental” includes syncopated piano fills and accordion played by Carlos Alvarez. On “La Cumbancha,” Leticia is joined by singer Lisa Morales, and together they create beautiful harmonies and accompany Al Gomez on the trumpet and Grammy nominated guitarist Joe Reyes. Leticia ends the EP with “Incertidumbre,” a passionate ballad in the style of a traditional bolero. She decided not to change the song from its original version, as she loved the arrangement that Eva Garza’s daughter, Rosa Maria Bojalil, had uncovered. On Sagüita Al Bate, Leticia Rodriguez Garza shows not only her talent as a vocalist and arranger, but emphasizes the importance and beauty of bringing music from the past into present, through both preservation and reinterpretation. This entry was posted in Latin by aaamc. Bookmark the permalink.